Eugene, Ore. • Mario Cristobal sprinted down the sideline beginning for a timeout. If Oregon was going to announce it was back among the elite of the Pac-12 Conference after a couple of down years, the coach wasn’t about to risk a pass when it was obvious for the Ducks to do just that. The Ducks were going to run. And they were going to give it to their young star running back seeking a bit of redemption for the mistake he made the last time Oregon was in a big game. “It was a matter if C.J. could run through an arm tackle and beat the safety,” Cristobal said. C.J. Verdell did exactly as Cristobal hoped, scoring on a 6-yard run in overtime, and No. 17 Oregon knocked off No. 7 Washington 30-27 on Saturday. The Ducks potentially ended the Pac-12’s hopes of landing a team in the College Football Playoff by getting the best of their rivals to the north after two straight years of receiving beatings by the Huskies. And it was Oregon running it right through the middle of the Washington defense for the final winning score. 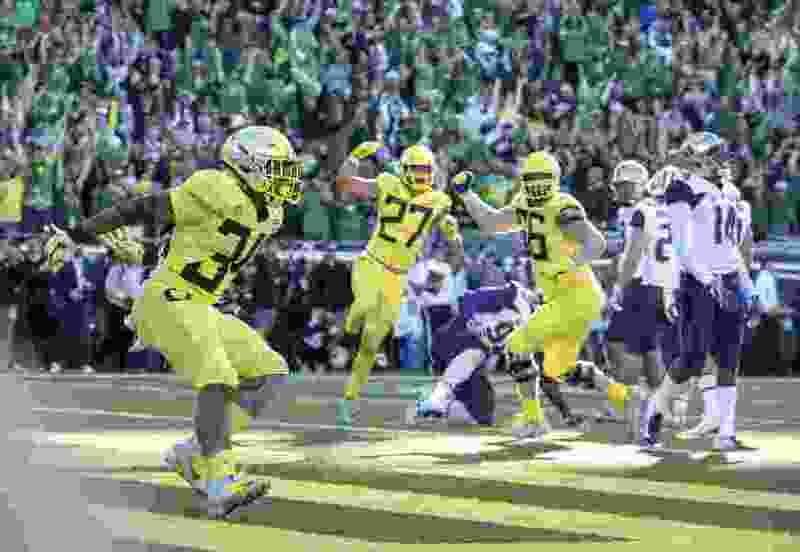 Verdell finished with 111 yards but none were sweeter for the Ducks than the final 6, when he sprinted nearly untouched on third-and-goal and set off a wild celebration in the east end zone of Autzen Stadium. Oregon originally lined up for the third-down play and appeared ready to pass. Cristobal didn’t like the call and instead decided to see if the Ducks could catch Washington off guard and looking for a pass. For Verdell it was a far different feeling than last month against Stanford when his fumble late in regulation led to the tying field goal for the Cardinal and a game the Ducks eventually lost in overtime. “I’m glad the coaches put the trust in me to run the ball. ... That hole was big. It parted like the Red Sea,” Verdell said. Two years ago, the Huskies snapped a 12-game losing streak to the Ducks with a 70-21 thumping of Oregon at Autzen. Last year it was a 38-3 rout in Seattle, two straight seasons of the Ducks being humbled by their neighbors to the north after a decade of dominance by Oregon. The Ducks (5-1, 2-1 Pac-12) were fortunate to reach overtime after Washington kicker Peyton Henry missed a 37-yard field-goal attempt on the final play of regulation. Henry’s kick was wide right. Washington (5-2, 3-1) took possession first in overtime but had to settle for Henry’s 22-yard kick after stalling inside the 10. The Huskies had a chance to force a long field goal as Oregon faced third-and-11 after a holding call. But Justin Herbert threw a strike to Dillon Mitchell for 17 yards and the Ducks had first-and-goal. Three plays later, Verdell sprinted into the end zone and soon after the field was a sea of green and yellow celebrating. Herbert didn’t have his best day, playing in front of a large gathering of NFL scouts and executives that included Denver Broncos GM John Elway. Herbert was 18 of 32 for 202 yards and two touchdowns of 12 yards to Mitchell and a key 9-yard strike to Jaylon Redd late in the first half that pulled the Ducks even at 17-all at halftime. Washington quarterback Jake Browning threw for 243 yards and threw a 43-yard touchdown to Ty Jones in the third quarter. The Huskies played parts of the second half without their top two running backs after Myles Gaskin and Salvon Ahmed both left with injuries and played sparingly in the closing minutes. Henry had missed three of his last four kicks entering Saturday, but hit from 41 yards earlier in the game. Oregon spent two timeouts trying to ice Henry for his final kick in regulation. He kicked both times after the timeouts were called, missing one and making one. But when it counted, Henry pulled his kick slightly and Oregon was given another chance in overtime. “It worked out well for us. The game went into overtime and this time we finished the job,” Cristobal said. UCLA 37, California 7 • In Berkeley, Calif., Joshua Kelley ran for 157 yards and three touchdowns to give coach Chip Kelly his first win at UCLA. The Bruins (1-5, 1-2 Pac-12) entered the day one of four winless teams in the FBS as part of their worst start since 1943. But UCLA dominated the trenches against the Golden Bears (3-3, 0-3) to give Kelly his first win as a college coach since leaving Oregon for the NFL following the 2012 season. Kelley scored on a 5-yard run to cap a 59-yard drive set up by a fumble by Patrick Laird in the first quarter. Then, after Cal finally got on the board with Laird’s 1-yard run on the opening drive of the second half, Kelley and the Bruins answered with two straight scoring drives capped by Kelley’s 1-yard runs that made it 27-7. He has been a bright spot in a down season for UCLA, becoming the first Bruins player with three straight 100-yard games since Jordon James in 2013. Keisean Lucier-South put the capper on the rout with a 38-yard fumble return for a score after one of Cal’s five turnovers. The Bears dropped their third straight conference game after starting the season 3-0 and getting into the AP rankings for the first time since 2015. The offense struggled for any consistency outside of the 75-yard drive to open the third quarter. Cal was stopped twice on fourth-and-short in the second half, dooming any hopes of a comeback. Brandon McIlwain completed 22 of 40 passes for 168 yards but was held to minus-2 yards rushing, lost two fumbles and threw two interceptions.